Contact Bill and Julie Ryder for more details. 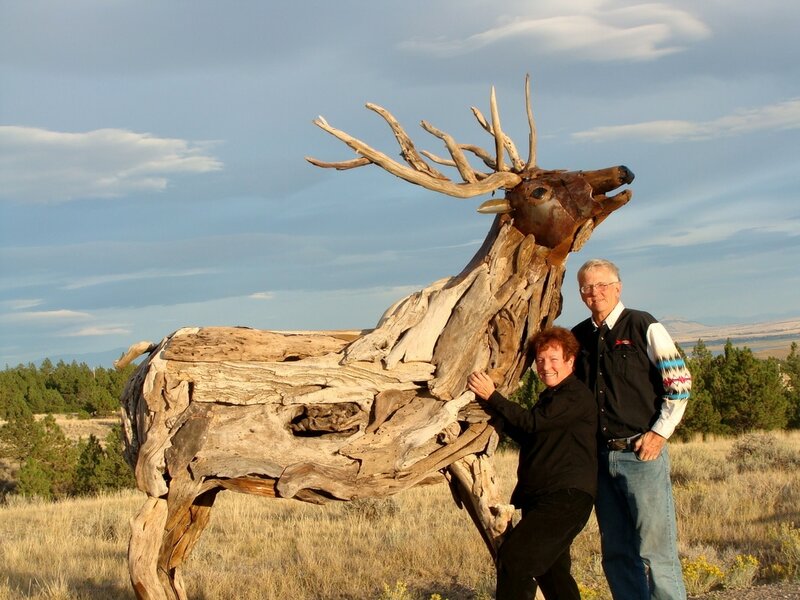 We created this nine foot driftwood and metal elk in the summer of 2015. 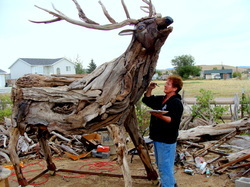 You can view this sculptue at Johnson's Nursery located at 5935 McHugh Lane at Sierra Road in Helena,Montana. 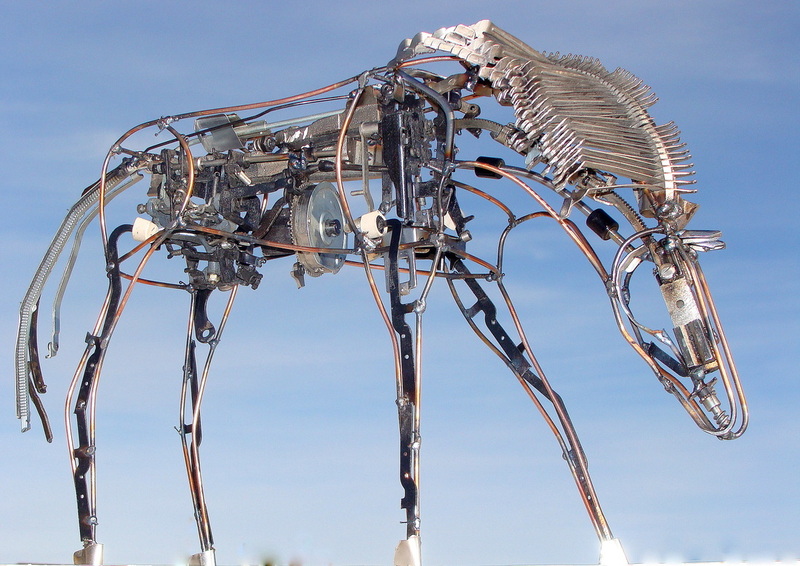 Full size stainless steel horse was created from 35-mm movie film, a lamp housing, film reels and platters, a projector motor and two video cameras for eyes. 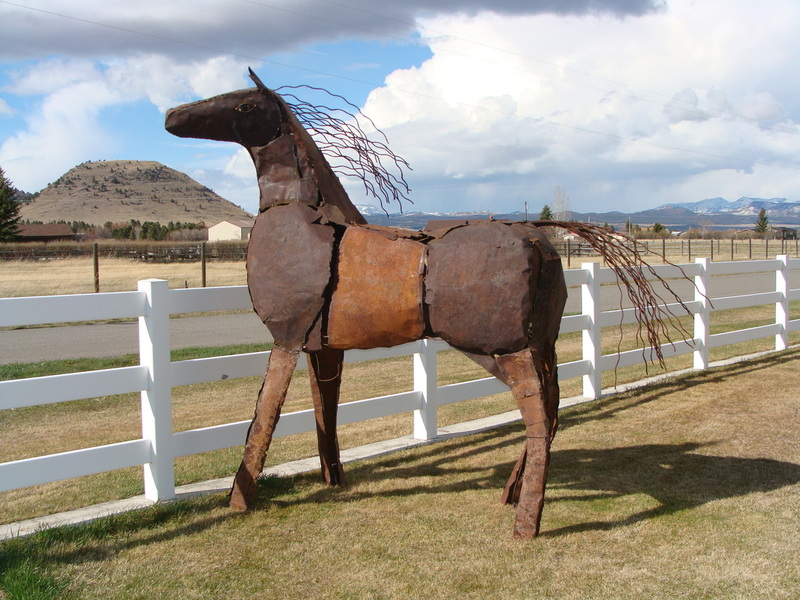 Created for a fund raiser, you can view this horse outside the Myrna Loy Center at Ewing and Breckenridge in Helena, Montana. Welded from trim pieces, the overall design appears like a quilt . Each piece of metal mirrors the reflected scenery. 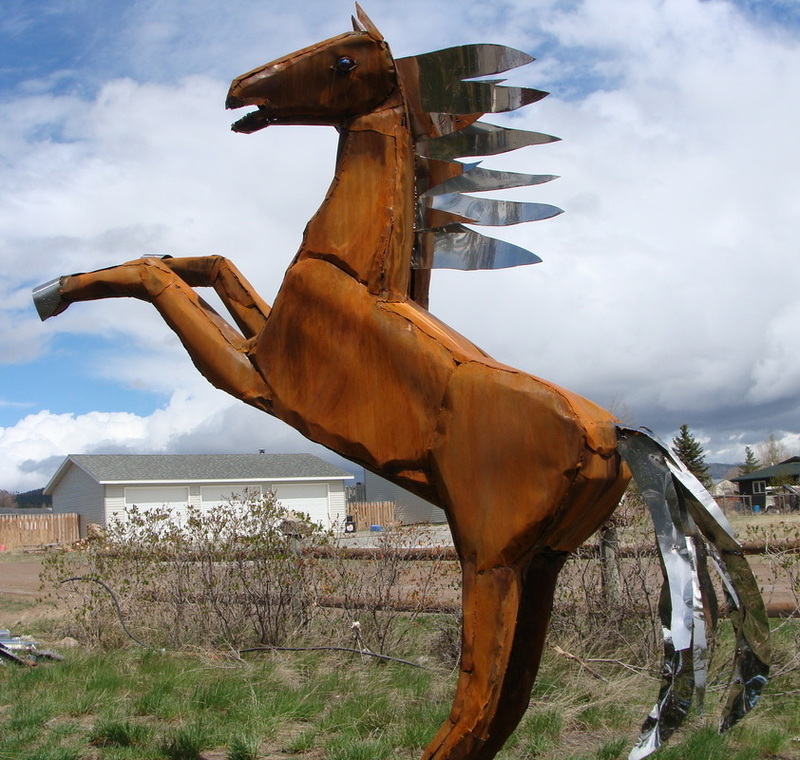 Polished, non-rusting, stainless steel horse stands over five feet tall. 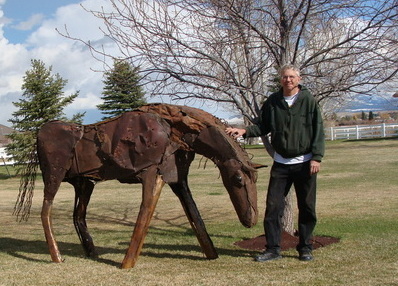 The smaller horse balanced on the back is 23 inches high. 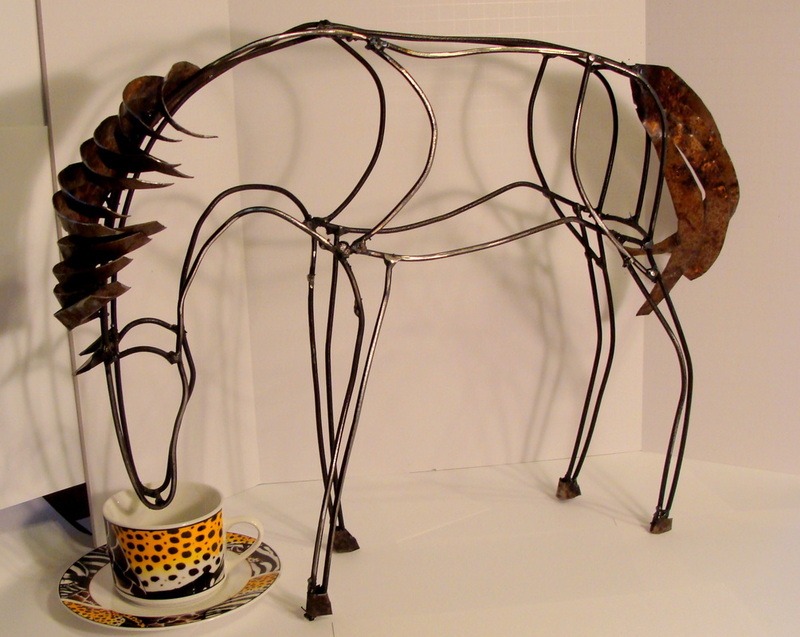 14" high ceramic and metal and horse. 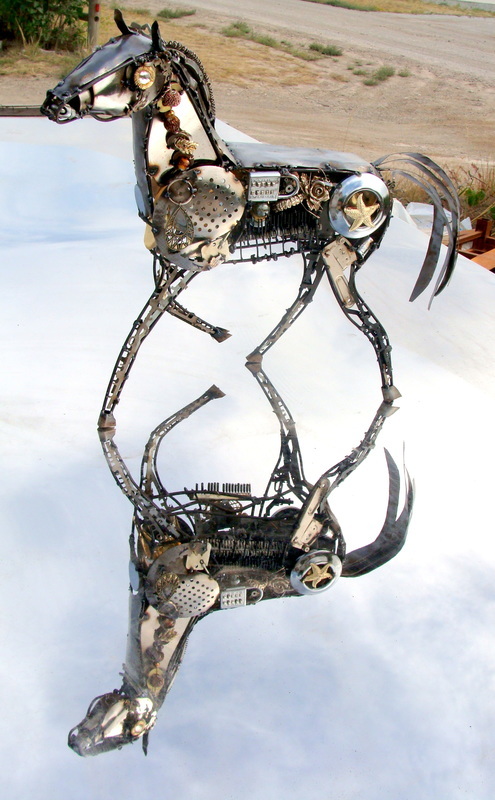 Stainless Steel horse is 22 inches high. 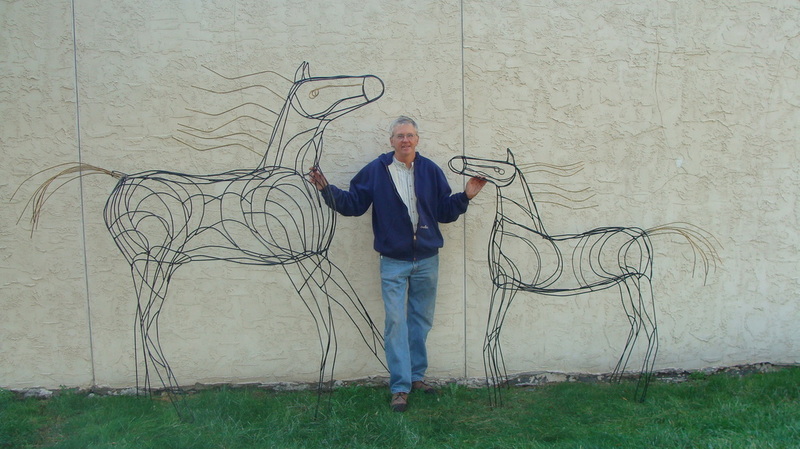 Ryder Horses at the Lewistown Art Center for a exclusive metal sculpture art show in May 2014. Pulled into Latigo and Lace in Augusta with a truck full of golden driftwood..
a truck full of possibilities. 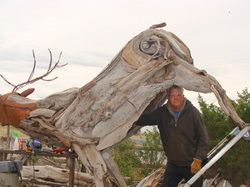 Driftwood sculptures are constructed from wood gathered in the wild places where beavers, woodpeckers, flowing water and wildfires sculpt the contours. 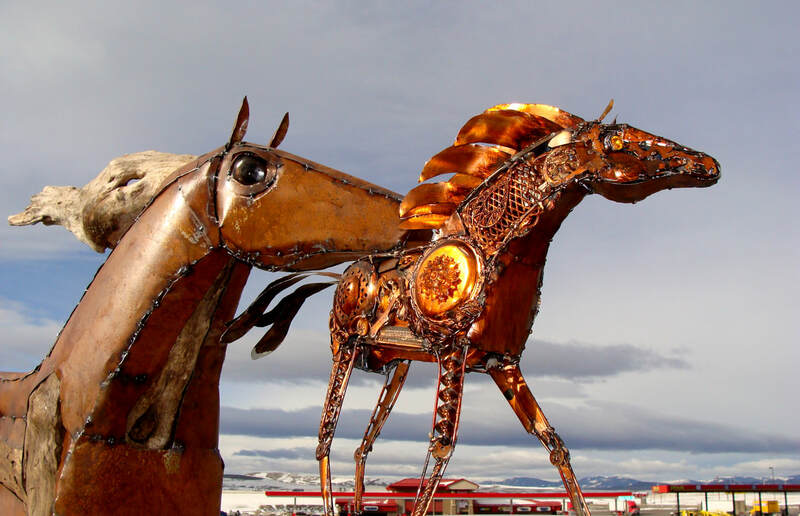 Life-like horses made out of rusted Montana ranch metal. 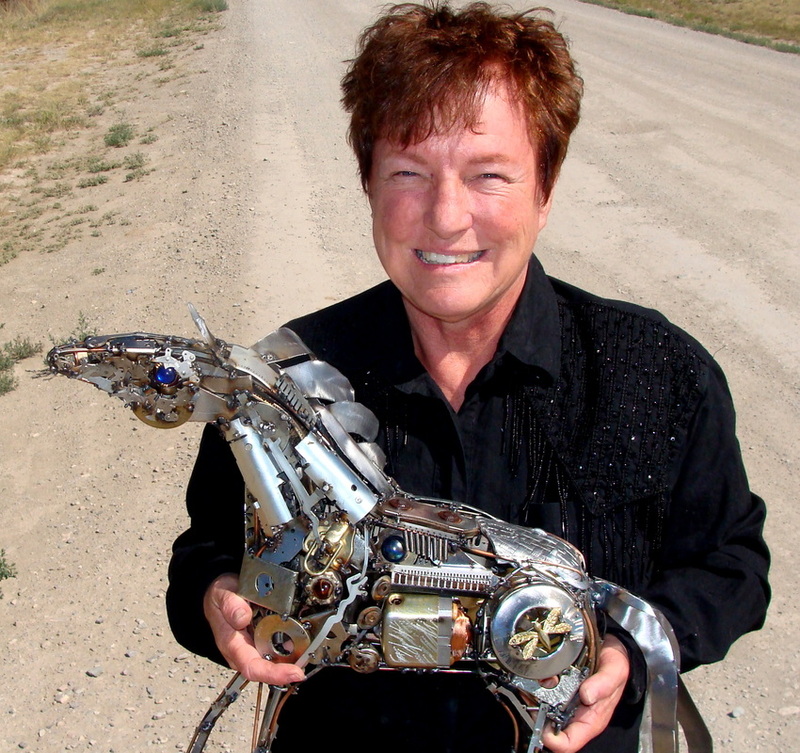 Julie created a stainless steel chrome display horse filled with one of a kind earrings and old treasures from estate sales. Designed with removable parts, the horse becomes a display holder for necklaces, bracelet and earrings. Rusted metal, iridescent ceramic shards and brass wire glisten. Patchwork horse was donated to a local non-profit. 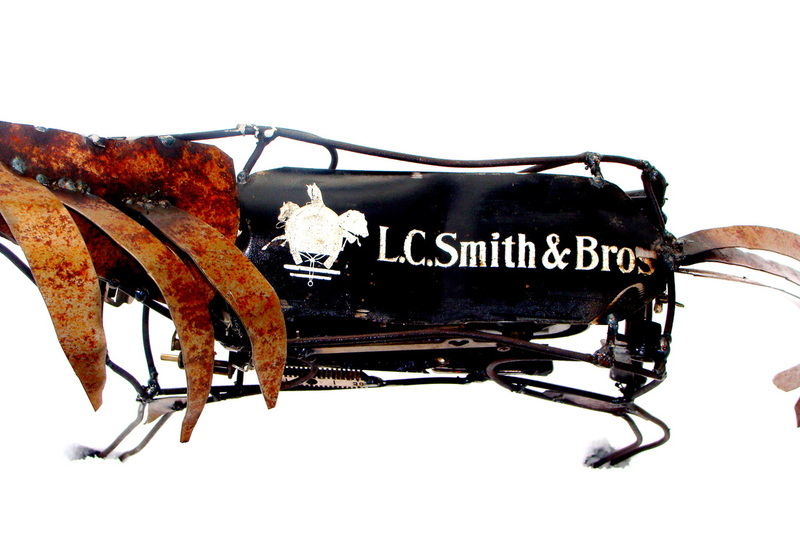 Steampunk Bird created exclusively from old typewriter parts and pieces. SHIFT and RETURN keys adorn the bird's back. non-profit organizations that serve children. 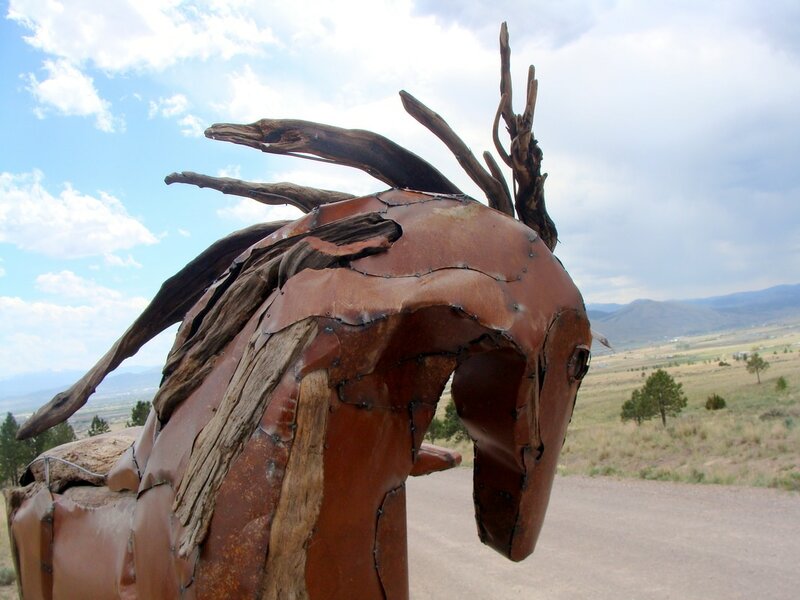 See yourself reflected in a three horse art instillation at Jefferson School on Broadway and South Dakota, two blocks from the Capitol in Helena, Montana. The best compliment we have ever received was the collective "aaahhh"
Mane and tail are bass piano strings. 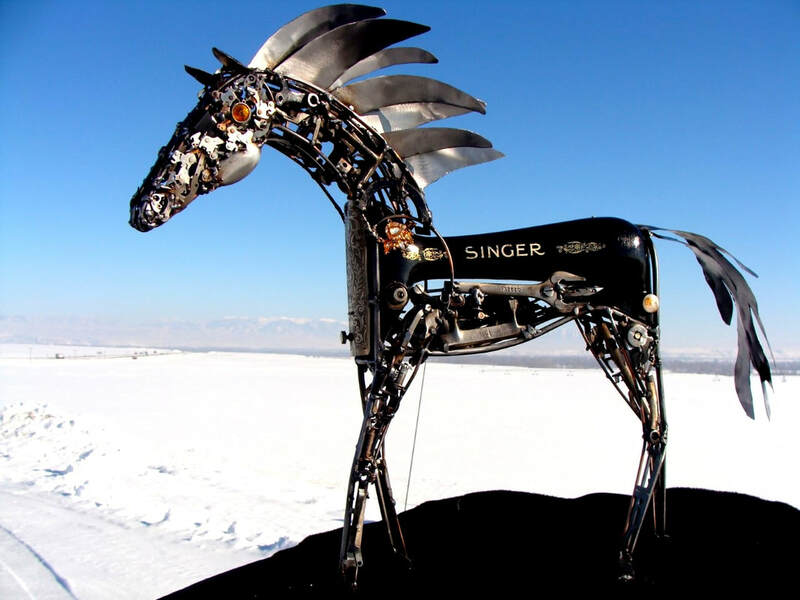 The horse was created from old harmonicas, saxophones, a french horn, a trumpet, a model-T car horn, xylophones, drums, trombones, clarinets, a Jew's harp, bells, cymbals and other musical instruments. Children as well as adults auditioned on the cymbals, xylophones and drums until the museum staff confiscated the drumsticks. 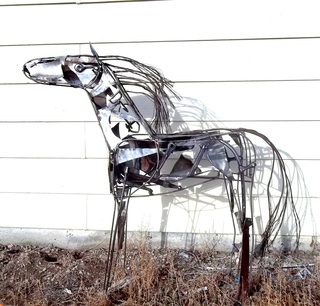 This fully covered metal horse was donated to Eagle Mount. She has become a landmark at Valley Veterinary Hospital on Montana Avenue in Helena, Montana. 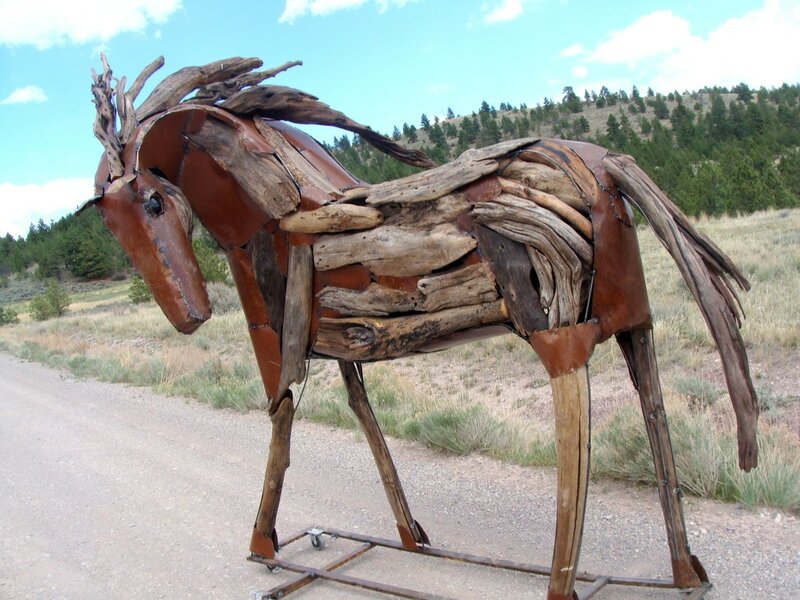 This is the same horse before and after rusting the body. The contrasting stainless steel mane, tail and hooves will never rust. 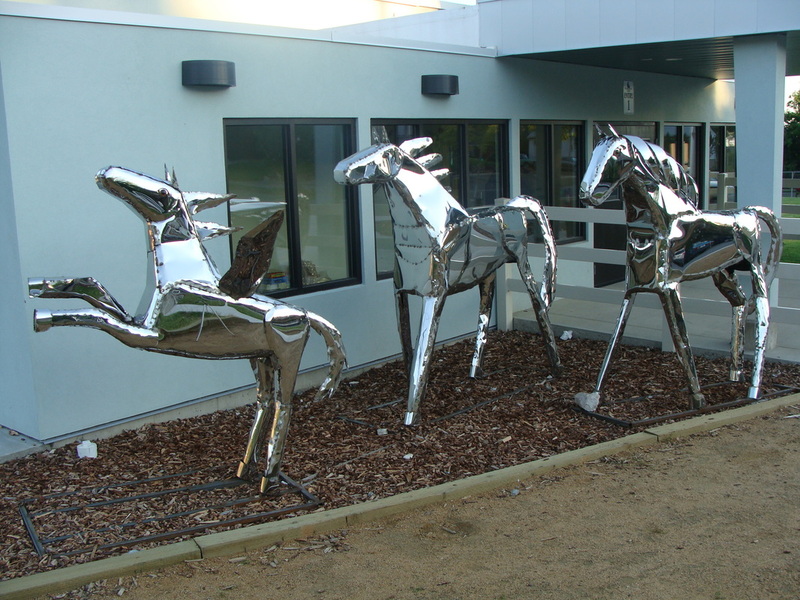 Metal horses typically cost from $3.00 to $3,000. 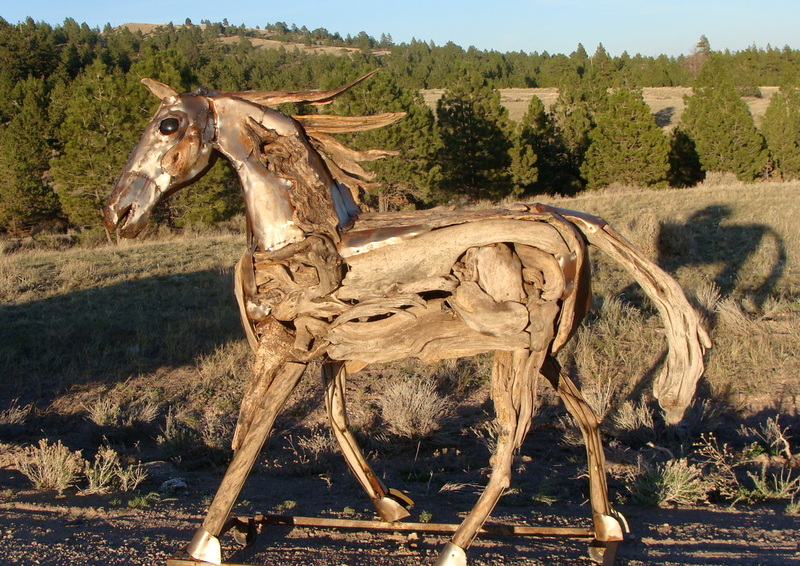 Driftwood and metal sculptures range from $1,000 to $5,000. Call or email for a quote on a special horse just for you. We work from photographs, drawings or composite images of your ideal horse to create a personalized custom horse. We can even brand it. Delivery and installation are included in the price if installed within the Helena, Montana area. We can arrange to personally deliver and install or crate and ship to most other places. This silver mare and colt was donated to the Florence Crittendon for the annual Paint the Town Pink and auctioned off for $4,400 in 2012. The purchaser generously supported the great work being done there. This was my 2014 donation to Florence Crittendon. 2014 was the Year of the Horse in the Chinese calendar system so I had to make a mare and colt for the auction which supports young mothers and their babies. 2014 Spring Art Gala donation to Jefferson Elementary School here in Helena Montana. The Gala features performance art, kid's creations and local artists to raise funds for art and music supplies and programs. Bollywood Horse donated to the Tibetan Childrens' Educational Foundation in 2014. 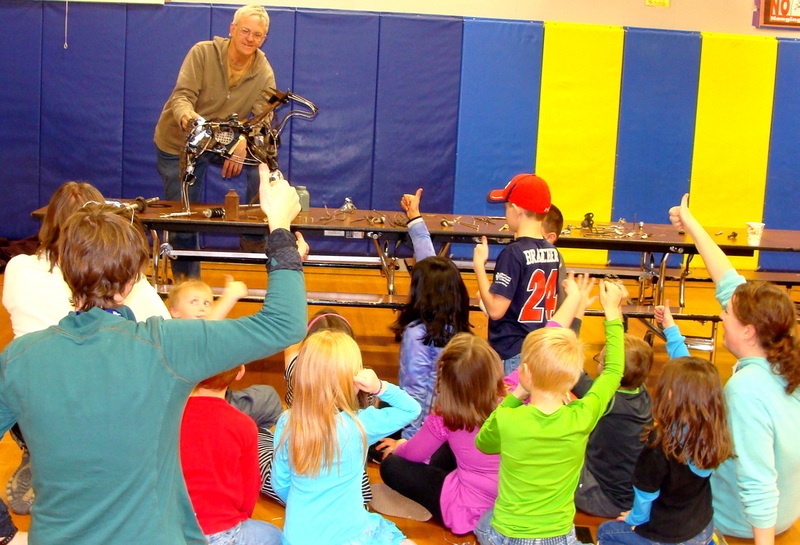 Kids at Jim Darcy Elementary School SACC were totally engaged in creating a Steampunk Metal Horse. Everyone gave a thumbs up rating for their horse. 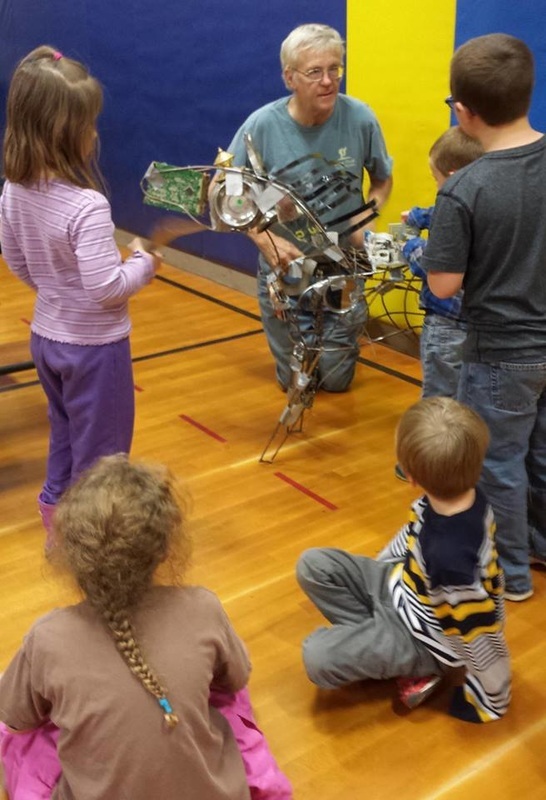 The kids practiced by bending aluminum wire into snakes, hearts, abstract art and imaginative pieces. In the classic story the horse carried the boy away to his next adventure. 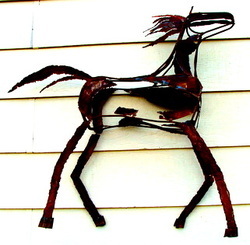 In our true story the boy carried the horse to the welding shop. They removed all the duct tape, and then welded the face, inset the selected marbles, joined the forks, fencing wire, bicycle chain, tools, engine parts and other metal treasures to a frame. 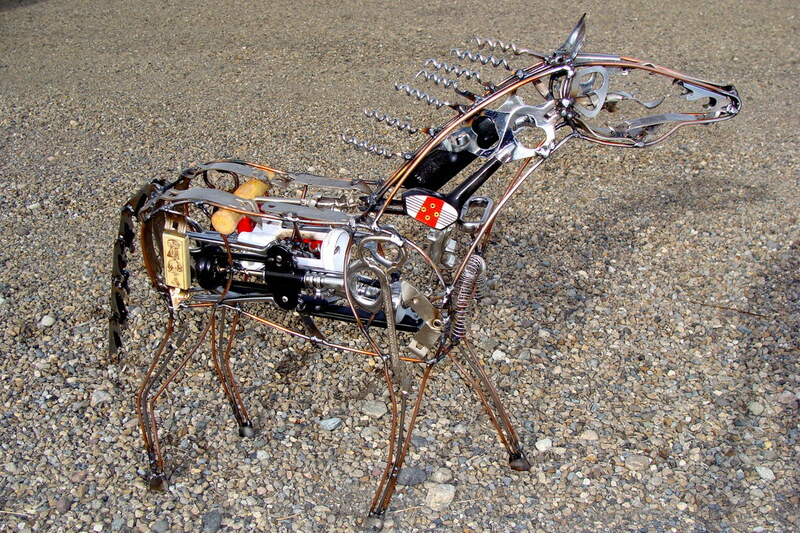 The Steampunk Horse along with the Fourth Grade Coffee Horse was auctioned at the Jim Darcy Holiday Bazaar. The Bazaar is an annual event to raise money for technology access in grade school. 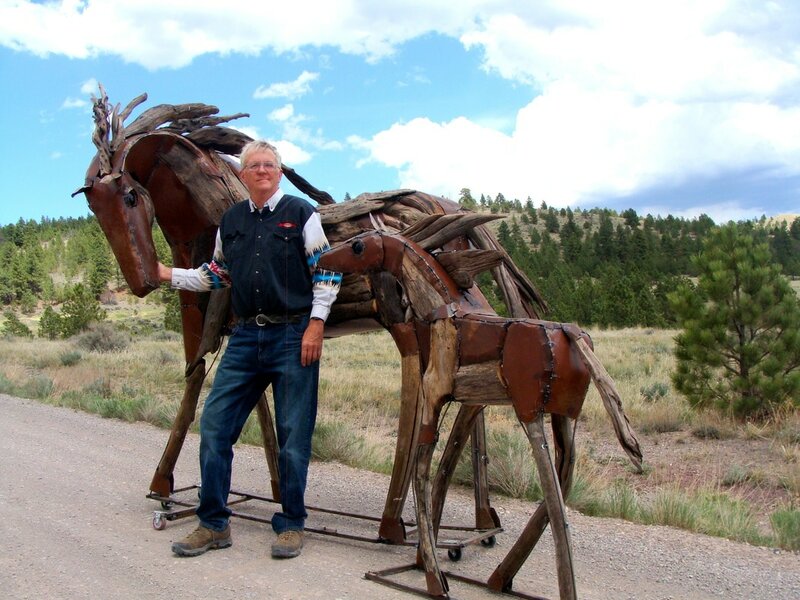 In 2015 the SACC kids at Jim Darcy Elementary created a larger and far more complex horse that was auctioned off at their Bazaar. "I have been working with metal most of my life. 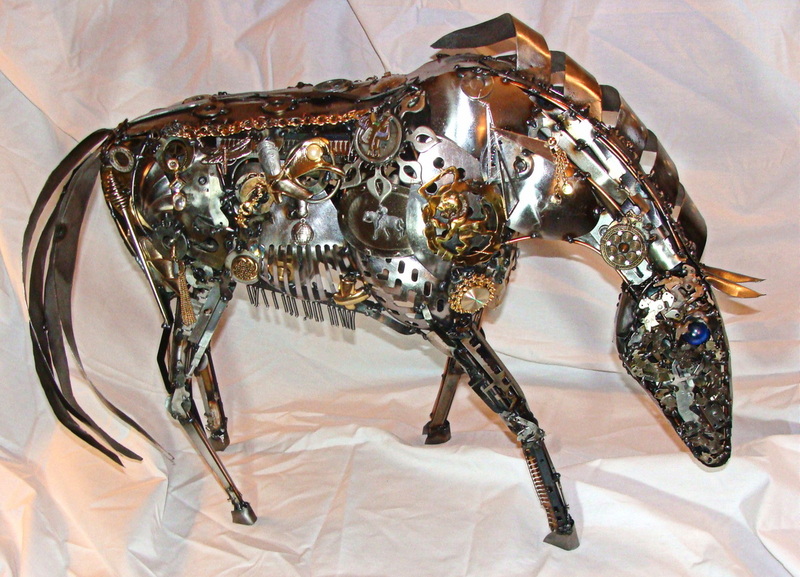 The last fourteen years I have been exploring the energy of representing the Spirit of the Horse in metal. The mare is about nine feet tall. These were an extra special birthday present. Notice the ribbon around their necks. She thought she was getting only flowers! Rodeo Bull is strong enough to ride and many a cowboy has tried his luck. He is eight feet from nose to rump. 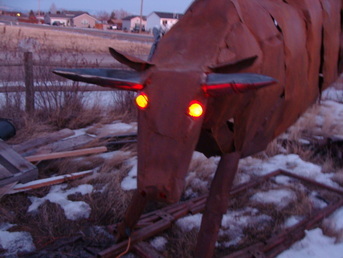 You can find is the bull at the Connoco station on Highway 12 East in Helena, Montana. The eyes light up golden red after dark. Simple curved lines express the powerful nature of a horse. 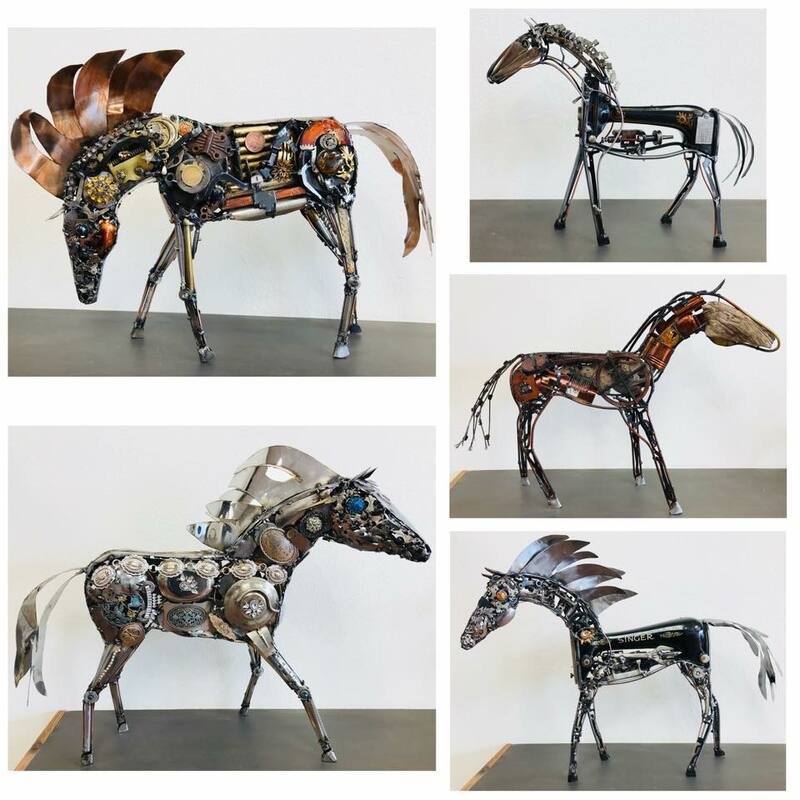 Bill uses various metal material to make horses such as found objects, new metal, wire made from a variety of metals and 1/4 inch rod. Sizes range from less than a foot tall to bigger than life size.